Every now and then, you read something that sticks with you and just won’t let loose. Know what I mean? You wake up thinking about it…see examples everywhere…can’t wait to tell other people…wish you’d thought of it first. That’s been going on for me for the past couple of months as we prepared for our recent Lead Her Up Retreat. Try as I might, this concept just wouldn’t let me rest. 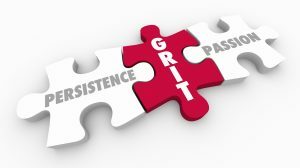 Grit, she says, is a combination of passion and perseverance in pursuit of an important goal. She has years of research to back up her theory. The more I think about it, the more I believe she’s really onto something. Thomas Edison is a great example. It’s no secret that Edison made many attempts before getting it right with the electric lightbulb. His take on it? “I have not failed. I’ve just found 10,000 ways that won’t work.” Now, that’s Grit! Henry Ford is another. Before making it big with the Ford Motor Company’s assembly line, Ford went bankrupt 5 times! A lesser person might have given up or turned to another line of work. But Grit in the face of failure is the reason that Ford is a household name today. Without Grit, Harry Potter might never have become one of the most famous characters in the last century. Millions of books, several blockbuster movies and a theme park are the result of the perseverance of author J.K. Rowling. When Rowling took the first manuscript of Harry Potter and the Philosopher’s Stone to publishers, it was rejected a total of 12 times before eventually being published. That publication opened the gates of fame and fortune for Rowling. Today, she is one of the richest women in the world…a far cry from the divorced single mother living on welfare who wrote that first book! Grit is not just for famous people, though. It’s something all of us can bring into our lives. First – Discover what you’re good at and make a list of those things. This is your list of possible areas where you can be a high achiever. Then – Find the thing that you’re good at that also lights up your heart. Remember, talent is not enough. There are plenty of talented people who never make it to those highest levels of achievement…because they don’t love what they’re good at with the single-minded, “it’s-as-important-to-me-as-breathing” kind of devotion. This is the passion that’s essential to Grit. Finally – Bring in the perseverance…the “I won’t let anything stand in my way” attitude. Talent and passion, without persistent action in the face of obstacles, will only get you so far. Perseverance is the secret sauce that takes you to the full expression of your talent and passion. It puts the cherry on top of the sundae. Now, let me ask you again. Got Grit?